Courtesy of National Review Online. “It was not because it was proposed to establish a new nation, but because it was proposed to establish a nation on new principles, that July 4, 1776, has come to be regarded as one of the greatest days in history. Great ideas do not burst upon the world unannounced. They are reached by a gradual development over a length of time usually proportionate to their importance. This is especially true of the principles laid down in the Declaration of Independence. Three very definite propositions were set out in its preamble regarding the nature of mankind and therefore of government. These were the doctrine that all men are created equal, that they are endowed with certain inalienable rights, and that therefore the source of the just powers of government must be derived from the consent of the governed. “If no one is to be accounted as born into a superior station, if there is to be no ruling class, and if all possess rights which can neither be bartered away nor taken from them by any earthly power, it follows as a matter of course that the practical authority of the Government has to rest on the consent of the governed. While these principles were not altogether new in political action, and were very far from new in political speculation, they had never been assembled before and declared in such a combination. But remarkable as this may be, it is not the chief distinction of the Declaration of Independence. The importance of political speculation is not to be underestimated, as I shall presently disclose. Until the idea is developed and the plan made there can be no action. “It was the fact that our Declaration of Independence containing these immortal truths was the political action of a duly authorized and constituted representative public body in its sovereign capacity, supported by the force of general opinion and by the armies of Washington already in the field, which makes it the most important civil document in the world. It was not only the principles declared, but the fact that therewith a new nation was born which was to be founded upon those principles and which from that time forth in its development has actually maintained those principles, that makes this pronouncement an incomparable event in the history of government. It was an assertion that a people had arisen determined to make every necessary sacrifice for the support of these truths and by their practical application bring the War of Independence to a successful conclusion and adopt the Constitution of the United States with all that it has meant to civilization. “The idea that the people have a right to choose their own rulers was not new in political history. It was the foundation of every popular attempt to depose an undesirable king. This right was set out with a good deal of detail by the Dutch when as early as July 26, 1581, they declared their independence of Philip of Spain. In their long struggle with the Stuarts the British people asserted the same principles, which finally culminated in the Bill of Rights deposing the last of that house and placing William and Mary on the throne. In each of these cases sovereignty through divine right was displaced by sovereignty through the consent of the people. Running through the same documents, though expressed in different terms, is the clear inference of inalienable rights. But we should search these charters in vain for an assertion of the doctrine of equality. This principle had not before appeared as an official political declaration of any nation. It was profoundly revolutionary. It is one of the corner stones of American institutions. “Of course, the world is always influenced by all the experience and all the thought of the past. But when we come to a contemplation of the immediate conception of the principles of human relationship which went into the Declaration of Independence we are not required to extend our search beyond our own shores. They are found in the texts, the sermons, and the writings of the early colonial clergy who were earnestly undertaking to instruct their congregations in the great mystery of how to live. They preached equality because they believed in the fatherhood of God and the brotherhood of man. They justified freedom by the text that we are all created in the divine image, all partakers of the divine spirit. “Placing every man on a plane where he acknowledged no superiors, where no one possessed any right to rule over him, he must inevitably choose his own rulers through a system of self-government. This was their theory of democracy. In those days such doctrines would scarcely have been permitted to flourish and spread in any other country. This was the purpose which the fathers cherished. In order that they might have freedom to express these thoughts and opportunity to put them into action, whole congregations with their pastors had migrated to the Colonies. These great truths were in the air that our people breathed. Whatever else we may say of it, the Declaration of Independence was profoundly American. “If this apprehension of the facts be correct, and the documentary evidence would appear to verify it, then certain conclusions are bound to follow. A spring will cease to flow if its source be dried up; a tree will wither if it roots be destroyed. In its main features the Declaration of Independence is a great spiritual document. It is a declaration not of material but of spiritual conceptions. Equality, liberty, popular sovereignty, the rights of man – these are not elements which we can see and touch. They are ideals. They have their source and their roots in the religious convictions. They belong to the unseen world. Unless the faith of the American people in these religious convictions is to endure, the principles of our Declaration will perish. We can not continue to enjoy the result if we neglect and abandon the cause. “But it is not results and effects so much as sources and causes that I believe it is even more necessary constantly to contemplate. Ours is a government of the people. It represents their will. Its officers may sometimes go astray, but that is not a reason for criticizing the principles of our institutions. The real heart of the American Government depends upon the heart of the people. It is from that source that we must look for all genuine reform. It is to that cause that we must ascribe all our results. “It was in the contemplation of these truths that the fathers made their declaration and adopted their Constitution. It was to establish a free government, which must not be permitted to degenerate into the unrestrained authority of a mere majority or the unbridled weight of a mere influential few. They undertook to balance these interests against each other and provide the three separate independent branches, the executive, the legislative, and the judicial departments of the Government, with checks against each other in order that neither one might encroach upon the other. These are our guarantees of liberty. As a result of these methods enterprise has been duly protected from confiscation, the people have been free from oppression, and there has been an ever-broadening and deepening of the humanities of life. “Under a system of popular government there will always be those who will seek for political preferment by clamoring for reform. While there is very little of this which is not sincere, there is a large portion that is not well informed. In my opinion very little of just criticism can attach to the theories and principles of our institutions. There is far more danger of harm than there is hope of good in any radical changes. We do need a better understanding and comprehension of them and a better knowledge of the foundations of government in general. Our forefathers came to certain conclusions and decided upon certain courses of action which have been a great blessing to the world. Before we can understand their conclusions we must go back and review the course which they followed. We must think the thoughts which they thought. Their intellectual life centered around the meetinghouse. They were intent upon religious worship. While there were always among them men of deep learning, and later those who had comparatively large possessions, the mind of the people was not so much engrossed in how much they knew, or how much they had, as in how they were going to live. While scantily provided with other literature, there was a wide acquaintance with the Scriptures. Over a period as great as that which measures the existence of our independence they were subject to this discipline not only in their religious life and educational training, but also in their political thought. They were a people who came under the influence of a great spiritual development and acquired a great moral power. “No other theory is adequate to explain or comprehend the Declaration of Independence. It is the product of the spiritual insight of the people. We live in an age of science and of abounding accumulation of material things. These did not create our Declaration. Our Declaration created them. The things of the spirit come first. Unless we cling to that, all our material prosperity, overwhelming though it may appear, will turn to a barren scepter in our grasp. If we are to maintain the great heritage which has been bequeathed to us, we must be like-minded as the fathers who created it. We must not sink into a pagan materialism. We must cultivate the reverence which they had for the things that are holy. We must follow the spiritual and moral leadership which they showed. We must keep replenished, that they may glow with a more compelling flame, the altar fires before which they worshiped” — President Calvin Coolidge, Excerpts of Address in Philadelphia, July 5, 1926. 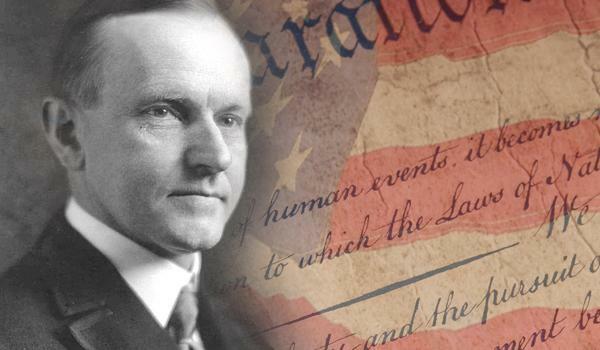 ← Happy Birthday Mr. Coolidge!